The online gambling industry has been on the move for the last years and the present ongoing development is an undeniable fact of the major success this domain enjoys these days. But just how much has the market grown over the last years? Will the growth continue? How much capital is available? 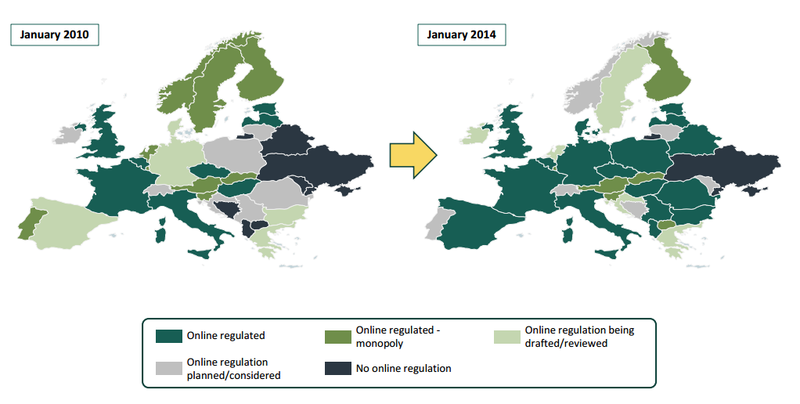 And which countries have adopted an online gaming regulation? These are just a few questions new operators, investors and stakeholders ask themselves before launching a new gambling website. Are you still riding the train of indecision and shiver over the right moment to access the world of gambling? Check the following insights, facts and figures we collected for you and make sure you are fully prepared to launch an online sportsbook or a casino right about now. The online gambling market is generally exhibiting solid numbers and the market has enjoyed a steady growth rate for a long period of time. 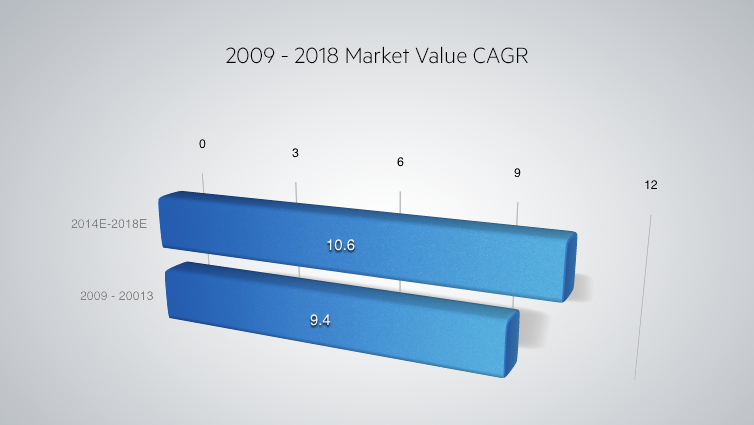 From 2009 to 2013 the average CAGR of the online gambling market was nearly an impressive 10 percent at 9.4 percent and it is expected to reach a two figure growth rate averaging 10.6 percent from 2014 to 2018. Why not grab your share of this growth? 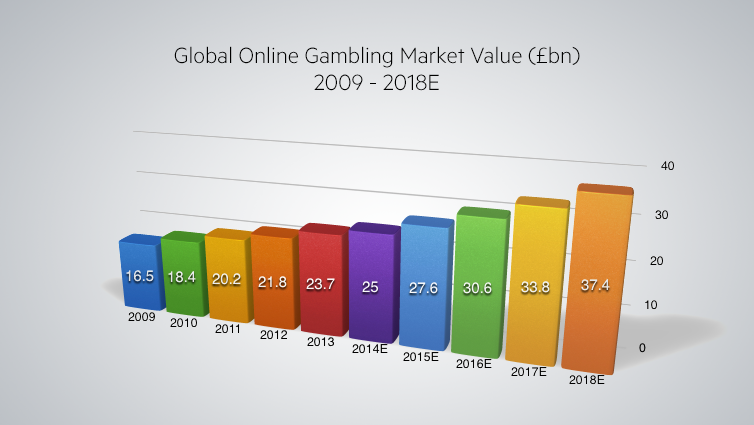 The online gambling market exhibits impressively steady growth rates. 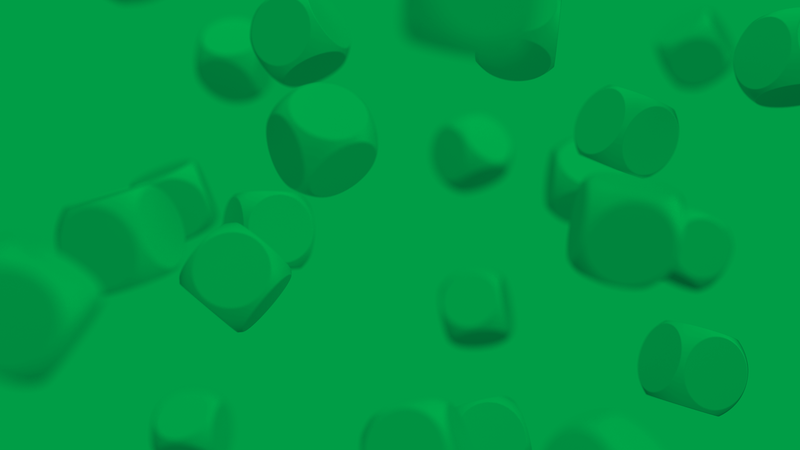 The steady CAGR has resulted in the total online gambling market value amounting to an impressive £23.7bn in 2013. In 2018 the market value is expected to hit a staggering £37.4bn. As a platform provider we can see very impressive growth rates from our best clients. What’s so appealing about online gambling is that it combines high growth rates with high appetite from consumers to try new brands. Market shares move towards those that innovate most and best embrace opportunities from new technology. It’s not all about marketing money – even if that certainly helps. The performance of the increasingly lucrative online gambling market attracts the attention of many investors. This is evident in the huge amount of funds waiting to be pumped into the market. 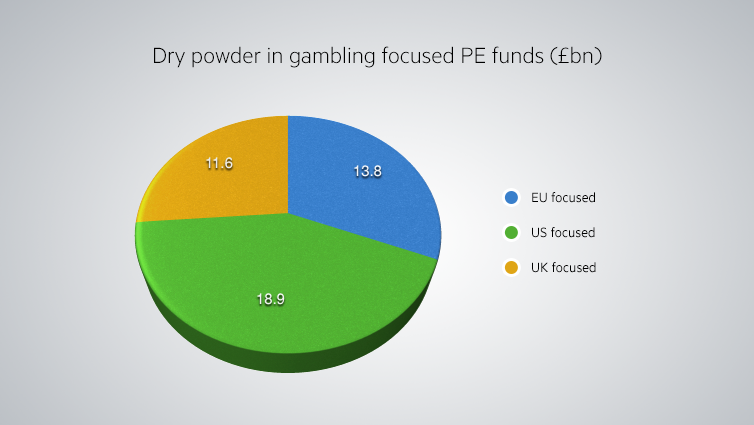 If we continue to analyze Tim Stocks’s paper, we notice that during the past 10 years, PE funds focusing on the US gaming market have raised a total of £18.9bn, while Europe and UK focused funds have raised £13.8bn and £11.6bn respectively. Thus, as of April 2015, a total sum of £44.3 billion is awaiting allocation from gambling focused PE funds. This indicates that a huge amount of funding can hit the gambling market any time and you should make sure to grab your share of that funding. Recent years have seen a change in the attitudes of European governments towards gambling and many nation states now either have introduced gambling regulation or is in the process of doing so. The introduction of gambling-friendly regulation and the abandoning of state monopolies in many jurisdictions, especially in Europe, provides a previously unforeseen amount of business opportunities attracting operators from all over the globe. Make sure to enter the market and make a name for yourself before the competition gets too rough. The trend of regulated remote gaming markets is unstoppable – a tendency offering unprecedented business opportunities. In the years to come, an increasing amount of adults will have grown up with computers and other smart devices as an integrated part of their everyday life. This will likely affect their propensity to use technology, including online gambling websites, for leisure purposes. As the popularity of smartphones and tablets continues to expand, gaming will remain a key component in the use of these devices. Although they are never used primarily for gaming, mobile games are the most downloaded application category across most application stores. Since Internet has erupted into the social sphere, a massive change occurred and our daily habits have been affected. New technological advances accelerated our lives’ beats and the latest online developments conveyed our sense of reality to the virtual domain. We do things faster than ever: we move faster, we communicate faster and finally we sure bet a lot faster. For this reason, we can say that today is a lot easier to place a bet than ever before. Studies show that the primary reasons for choosing online gambling instead of the land based alternative is convenience, comfort and ease of internet gambling and that this is what attracts people to online gambling. Convenience and comfort of gambling from home being the main reasons for preferences towards iGaming versus land-based gaming indicates that iGaming has a competitive advantage that will last. According to a study by Gainsbury, Parke & Suhonen (2013) indicates that online gambling frequency is now double than that of land-based gambling operations. 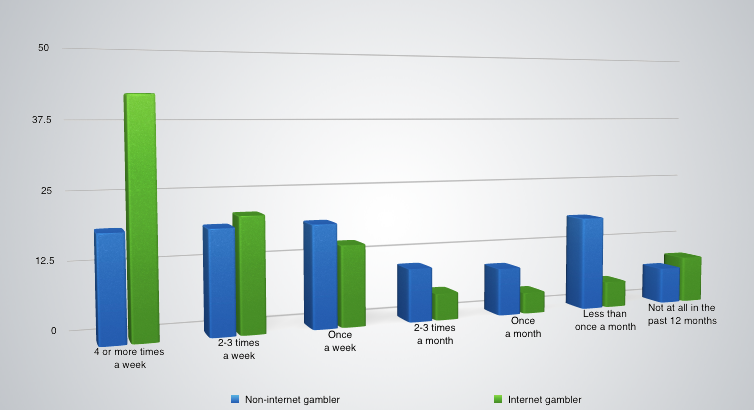 While 43 % of internet gamblers gamble 4 or more times per week, this number is only 19.3 % for non-internet gamblers. Get in there and make that incredible gambling frequency your business driver! But is that enough to drive investors and new gaming operators launch their perfect sportsbook or casino? The solid performance exhibited by the iGaming industry over the past 6-7 years provides additional reasons for operators and investors to maintain a positive impression and start their gambling projects as soon as possible. Should you choose to realize your dream, you might want to consider employing a white label solution, which is by far the easiest and most convenient way to start an online gambling business, allowing operators to leave aside for a while the technical requirements and focus on the marketing aspects of the business. We believe the facts and figures we collected here managed to convince you that we are living in one of the best periods to launch an online gambling business right about now.